For Tue Mar 5 2019 stocks finished the day slightly lower as investors continue to wait for some kind of concrete news on trade talks with China. All 3 indexes had a roller coaster day but by the close all 3 were down slightly. Tuesday saw the S&P close below 2800 again and intraday the index fell to the 21 day moving average, again. The closing candlestick was bearish for Wednesday. The 100 day moving average is still not above the 200 day and the 50 day moving average is still trying to climb. Meanwhile the Upper Bollinger Band is falling and the Lower Bollinger Band is rising in what could be a Bollinger Bands Squeeze which could occur shortly. This could send stocks higher or lower, but if the squeeze occurs there will be a change in direction. There are still 3 up signals in place and 6 down signals. 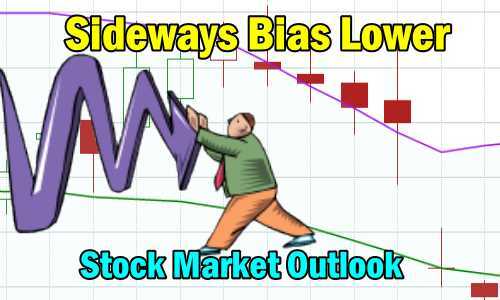 The down signals will begin to be dropped as the moving averages recover to their correct positions with the 21 day on top and the 50 day leading the 100 and 200 day moving averages. The 100 day moving average is trading below the 200 day and could cross above it at any time. This would be a major up signal if it occurs. The 2600 level has anchored the rally since January 14. The 2700 level has been held for the entire month of February. Both of these are bullish signs. Today stocks stayed above Monday’s intraday low which is a bullish sign, although as members know, the Market Breadth Indicators are becoming a bit more concerning as they weaken. Momentum: Momentum is positive and was falling on Tuesday. MACD Histogram: MACD (Moving Averages Convergence / Divergence) issued a down signal on Thursday February 28 2019. The sell signal was stronger on Tuesday. Ultimate Oscillator: The Ultimate Oscillator signal is moving sideways. Slow Stochastic: The Slow Stochastic has a down signal in place for Wednesday, helping to confirm the down signal from MACD. It is also overbought. Relative Strength Index: The RSI signal is falling further. Rate of Change: The rate of change signal is falling indicating that prices will be moving lower. For Wednesday I am expecting another sideways day with stocks still holding a bias to the downside. Monday saw stocks take a bit of a beating, but Tuesday they turned more sideways and failed to retest the lows from Monday. That often is a bullish sign. Any negative news on the China trade talks and stocks will resume selling. Any positive news on the talks and stock should easily move above 2800. For Wednesday, without either of those events occurring, I am expecting a sideways day with a bias lower.